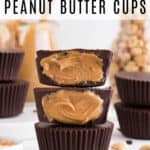 These homemade peanut butter cups are SO delicious. The rich dark chocolate coating, filled with creamy peanut butter inside, will have you craving more! This recipe is super easy to make and only requires 4 ingredients. 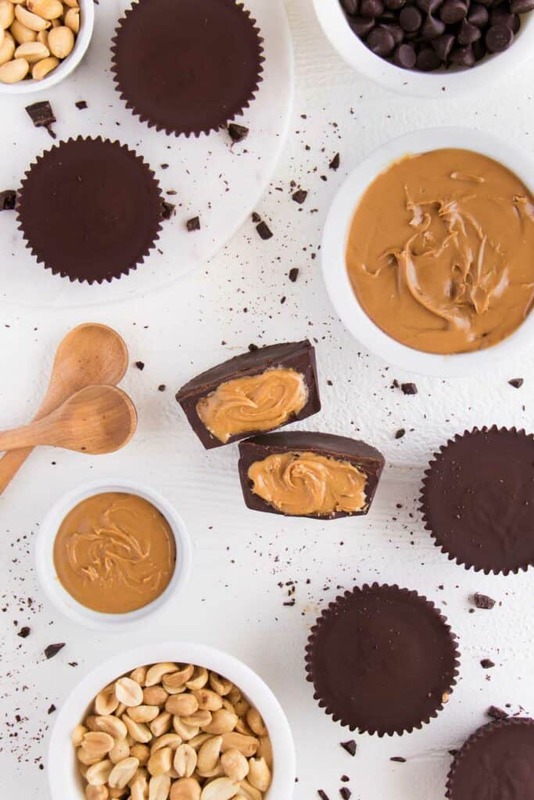 Is there any better combination than chocolate and peanut butter? I don’t think so! There’s a reason Reese’s are so dang popular. 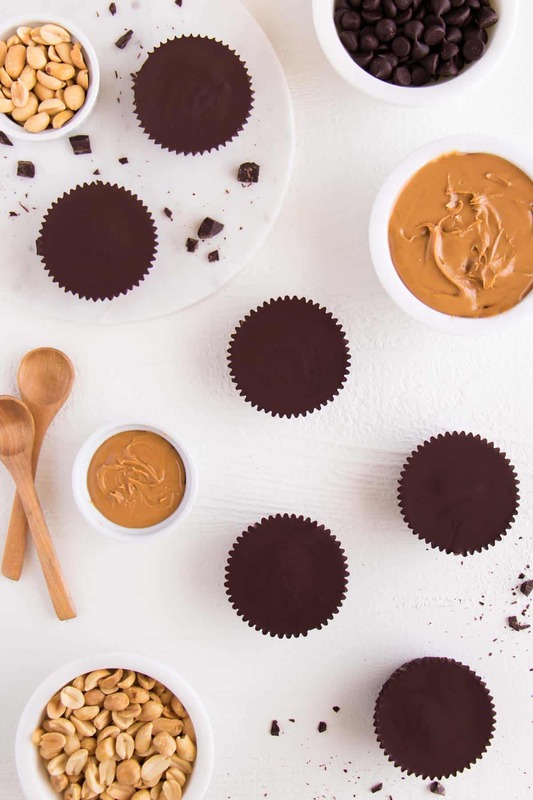 Something about sweet chocolate paired with salty peanut butter is ridiculously tasty. Good luck trying to only eat one! This recipe is a healthy twist on the original, but it’s equally delicious. 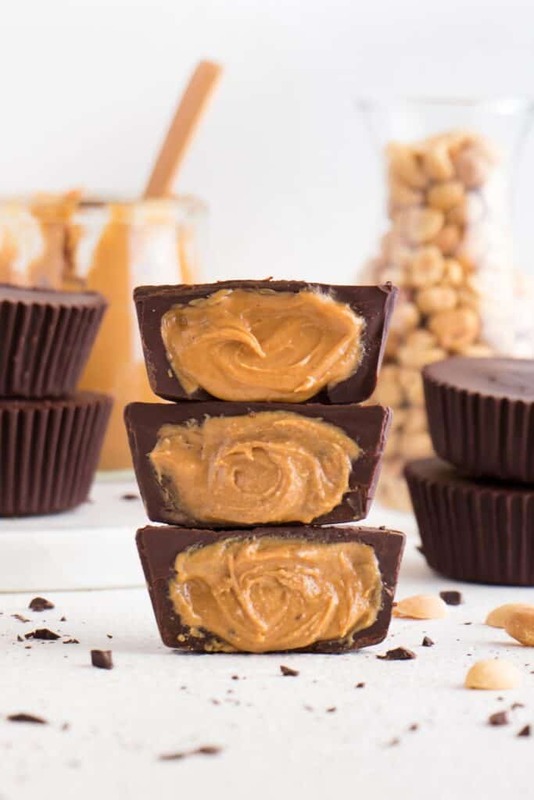 These homemade peanut butter cups are vegan, gluten-free, and require just four ingredients. First, line a muffin tray with nonstick liners. Then, combine the peanut butter and coconut sugar. Next, melt the chocolate chips and coconut oil. After, spoon a layer of the melted chocolate + a dollop of peanut butter + more melted chocolate into each liner. Lastly, store in the refrigerator to solidify. 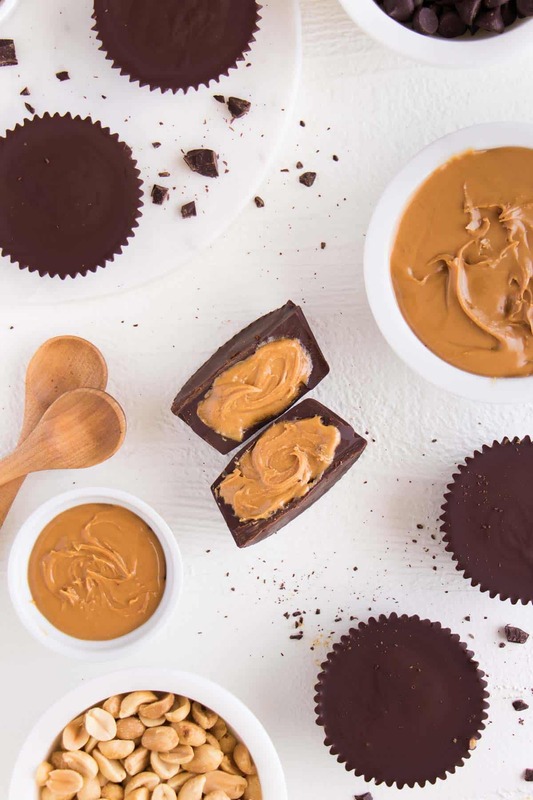 Use your favorite type of nut butter! Personally, I recommend this natural peanut butter, but almond butter would be just as tasty. Also, if there’s a nut allergy, you can use sunflower seed butter instead. I recommend coconut sugar, but any type of sugar can be used. 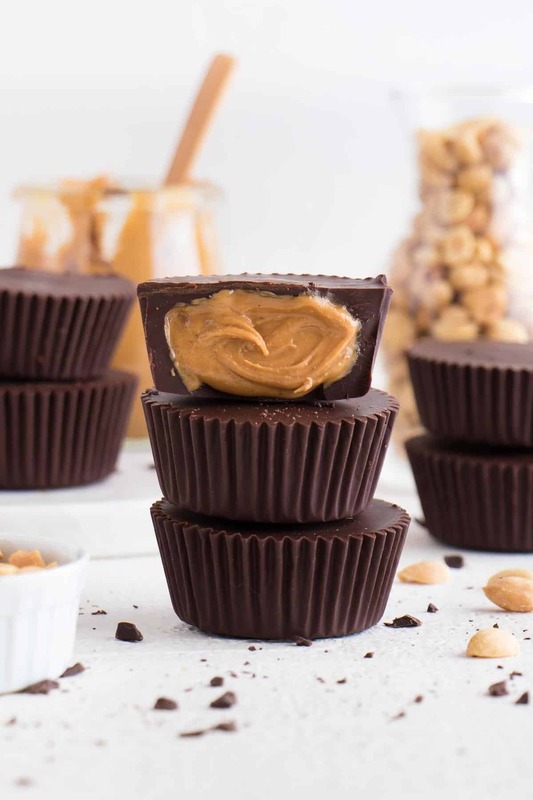 Make these peanut butter cups as big or as small as you’d like! I find a thick layer of chocolate to taste best, but you could make the chocolate layer thinner if you’d like. 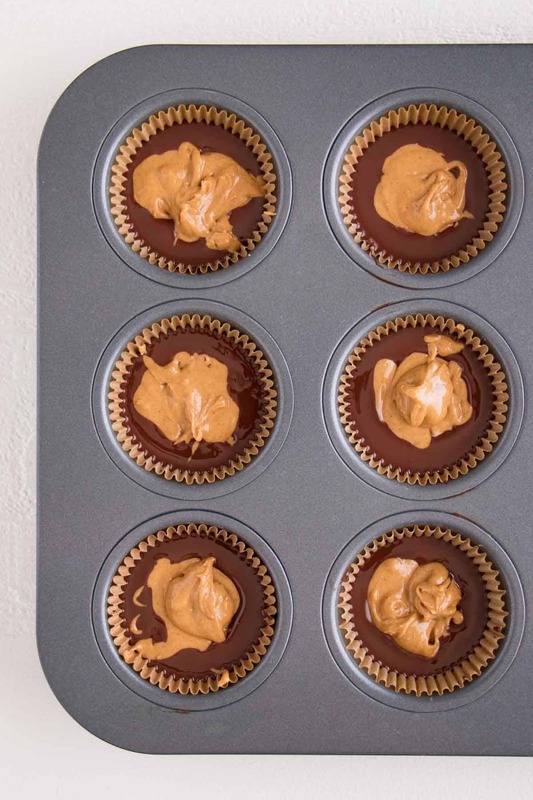 A mini muffin tin can be used to create mini peanut butter cups, too. 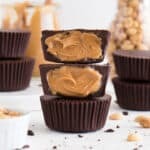 These homemade peanut butter cups are SO delicious and easy to make! This healthy dessert is vegan, gluten-free, and requires only 4 ingredients. Mix the peanut butter and coconut sugar in a bowl. In a separate bowl, combine the dark chocolate chips and coconut oil. Microwave on 30 second intervals, stirring in between, just until the chocolate chips melt. Do not burn the chocolate! This should only require 2 or 3 intervals. Spoon a layer of the melted chocolate into each muffin liner. Then, add a dollop of peanut butter into the center. Cover an additional layer of melted chocolate on top. Store in the refrigerator until the chocolate solidifies. This should only require about 15 to 20 minutes.